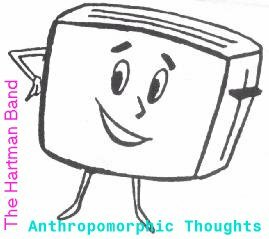 The Hartman Band's long-awaited third album, Anthropomorphic Thoughts, was released in late 1997 from JLK Records. The 60-minute cassette features 17 songs and is the Hartman Band in their most rocking form ever. This album was recorded on December 27, 1995 at Kelly�s House and was mastered on November 18, 1996 at JLK Studios. The song selection is a varied mixture of originals and covers; as in previous recordings, most of the original songs are conceived on the spot and none of the lyrics were written down beforehand.